Waco Friends of Peace/Climate will answer this action call and support the event with a contingent. The plan is to leave from Alan Northcutt’s house (or another central location) about 5:30 or 6:00 AM. Each person should make a sign to carry. And hopefully we will have time on the way back for a delicious vegetarian meal at the Austin institution of Mother's. It's important to support other activists, and it should be fun. 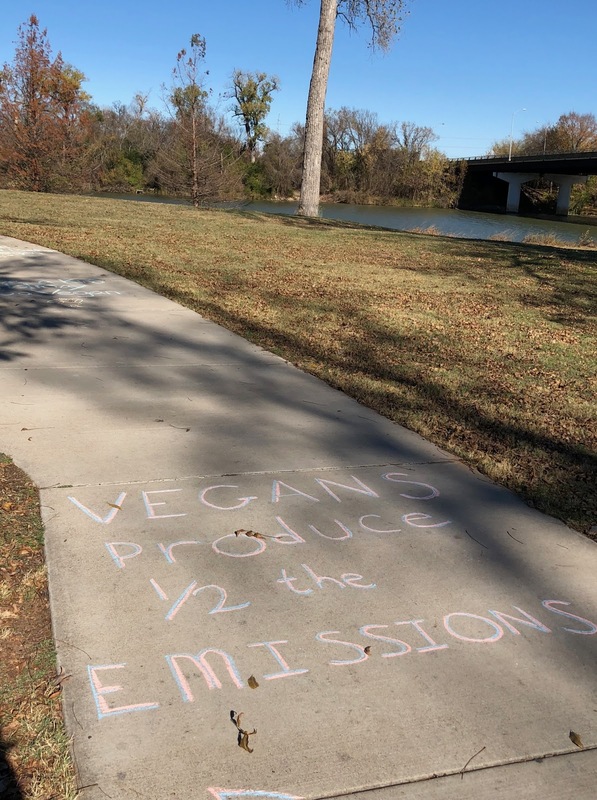 On December 9, 2017, a chalking took place at Cameron Park in Waco. The message: a vegan diet produces approximately one half the GHG emissions as a carnivorous diet. This is one of the best ways to lighten one’s carbon footprint. 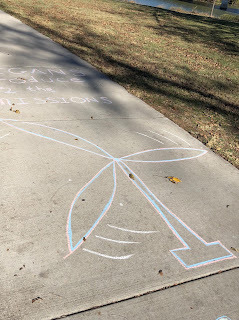 Chalking may reach those who do not utilize standard media. 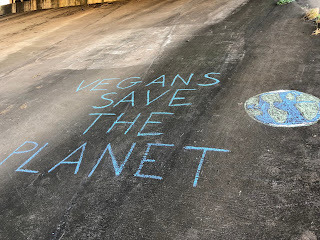 Thanks go to Bessie VonMessenger for organizing this vegan chalking and to Travis Hipp for his participation. With the one-year mark of the Trump presidency at hand, we count down 10 of its most destructive policies on climate and the environment. 10. Science funding slashed: Science-related programs were cut by at least $7 billion in Mr. Trump’s budget, including deep reductions to the Department of Energy and Environmental Protection Agency, as well as to NASA earth science programs, ocean ecosystem monitoring, space station CO2 tracking, the deep space climate observatory and NOAA research. A country smothering science is in decline. 9. River protection ended: Trump signed a joint resolution of the Republican Congress revoking the Stream Protection Rule, thus allowing mining waste to contaminate small rivers. 8. Pipelines green-lighted: The Dakota Access and Keystone XL oil pipelines were approved by Trump after vigorous opposition from Native Americans and other activists. Building new fossil-fuel infrastructure when we must instead rapidly transition to renewables is absolutely counterproductive. 7. Climate experts lost: Approximately 770 EPA staff members have left the agency, many reportedly expressing disgust with agency direction under Scott Pruitt. Further, numerous U.S. climate scientists are migrating to France, enticed by President Macron’s commitment to climate action and his offer of 50 research grants. 6. Clean Power Plan nixed: The Plan was the primary method for reaching U.S. pledges under the Paris Agreement. It would cut carbon emissions 32 percent by 2030 and prevent thousands of premature deaths and asthma attacks. Trump’s proposed repeal of the Plan would increase U.S. carbon emissions, cost lives and not produce a major resurgence of coal, according to most analysts. 5. Climate-change language censured: In Orwellian fashion, the EPA and Department of Interior have scrubbed their websites of “climate change.” Further, the Centers for Disease Control reports a list of banned words, including such innocuous terms as “science-based,” “evidence-based” and “diversity.” Trump may not realize banning “climate change” does not halt its progression. 4. National monuments miniaturized: Trump reduced the size of breathtaking Bears Ears National Monument by 85 percent and Grand Staircase-Escalante by 50 percent, despite fierce opposition from Native Americans and environmentalists. These steps will cause destruction of sacred Indian sites, contamination of the land when the new fossil-fuel infrastructure leaks and spills, and an increase in our greenhouse-gas emissions. 3. Paris Agreement exited: With withdrawal from the Agreement, the United States became the solitary rogue nation not participating in this global pact to mitigate climate change. Although market forces will continue to propel the growth of renewable energy, this step will stall climate action at the federal level and eliminate our global leadership on climate. 2. Dangerous drilling expanded: Trump has expanded drilling into the pristine Arctic National Wildlife Refuge and protected areas of the Atlantic, Pacific and Arctic oceans. At the same time he has eliminated drilling safeguards and safety research. The potential for local spill disasters and emissions increase are enormous. 1. Administration oiled: The administration personnel of Mike Pence, Rick Perry, Scott Pruitt, Wilbur Ross, Rex Tillerson and Ryan Zinke offer a rogue’s gallery of climate-science deniers, oil industry lackeys and EPA enemies. 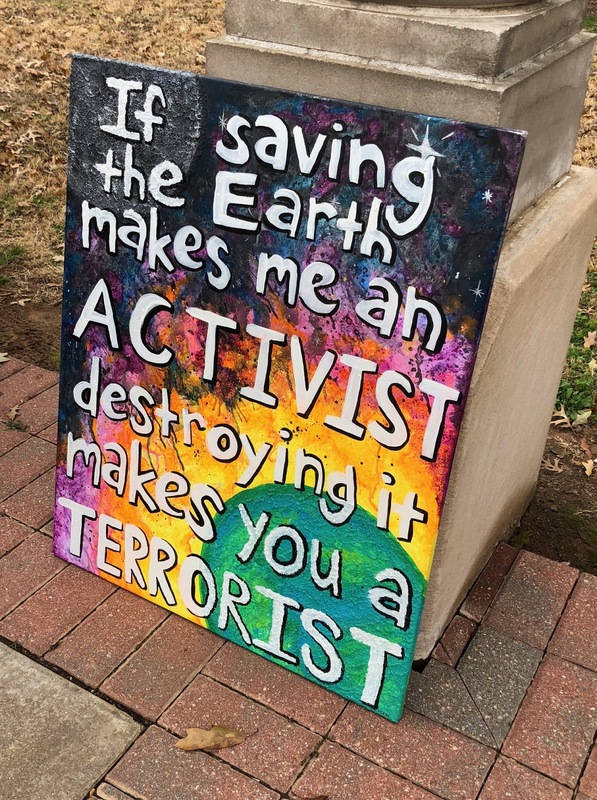 This executive branch thus serves the interests of the fossil-fuel industry rather than protecting the environment in service of the American people. The damage of increased use of fossil fuel consists of cardiopulmonary injury to people, contamination of land and water from spills and leaks, increased carbon dioxide and methane emissions when slashing emissions is critical and lowering U.S. competitiveness as the world moves to renewable energy. A typical reaction to the past year is outrage, anger and despair. But action remains the best antidote. 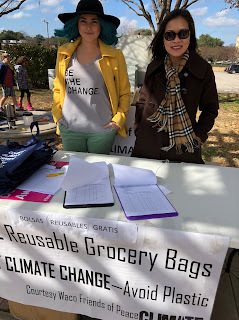 We must protect our climate and environment by constantly opposing Trump’s agenda and by voting for candidates committed to fighting anthropogenic climate change. Save this date: March 29th! 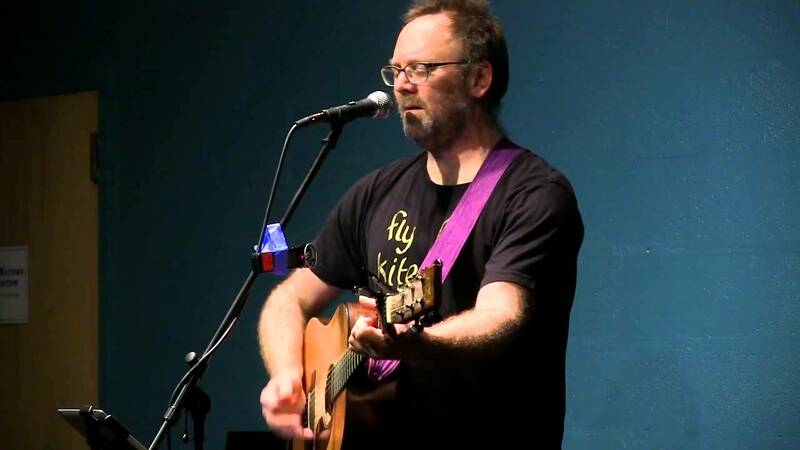 Waco Friends of Peace/Climate will bring back David Rovics for a second Waco performance. David is an outstanding singer/songwriter, performer and activist, with multiple recorded albums. He will perform on March 29th at the Mission Waco Jubilee Theater at 1319 N.15th St. Doors will open at 6:00 PM. Details to follow. 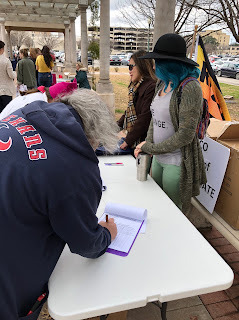 Waco Friends of Peace/Climate was present with a table at the Women’s March Anniversary Rally on Saturday, January 20th. Alan Northcutt was allotted time for a brief speech, during which he talked about several major events during 2017: the January 20 anti-inauguration protest, the Earth Day free reusable bag distribution, the September climate change art show, and the Go Renewable Waco campaign. 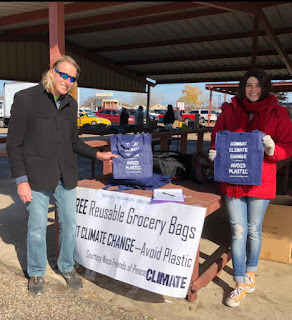 He encouraged the attendees to go by the FOP/C table and obtain free shopping bags and sign the renewable Waco campaign petition. 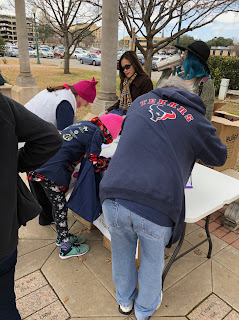 The response was fantastic – about 160 people signed the petition to the city council, thus reaching and surpassing the goal of 1000 signatures. About 250 reusable shopping bags were given out. Thanks go to FOP/C members Serena and Ana, as well as to the CAN organizers, whose planning and hard work made the event possible! Arrive by 5:45pm (session begins at 6:00pm). Not necessary to fill out card at entrance. Simply enter theater and sit together. Wear some shade of green top, shirt, blouse, etc. Our single presenter should begin within 20 minutes of session beginning and will last for 10 minutes. We may leave after the presentation is completed. Our organization will provide dinner to all attendees after the session (details to follow). Please forward any remaining petition signatures to: anorthc@aol.com. MOST IMPORTANT: to FILL the theater with a sea of green. Please bring everyone from McLennan County you can find-- family members, kids, friends, colleagues, co-workers, etc. We would greatly appreciate all our BAYLOR friends support on this day. We wish to provide follow-up information to clarify some questions that arose at the January 16 meeting. The only labeling required by federal law in the US is for baby formula. Examination of food for changes in odor, color, texture and taste is the best method of determining if a given food item is safe. We all love food. As a society, we devour countless cooking shows, culinary magazines and foodie blogs. So how could we possibly be throwing nearly 50% of it in the trash? Filmmakers and food lovers Jen and Grant dive into the issue of waste from farm, through retail, all the way to the back of their own fridge. 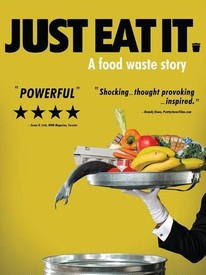 Just Eat It brings farmers, retailers, inspiring organizations, and consumers to the table in a cinematic story that is equal parts education and delicious entertainment.